From two-time Academy Award®-winner Pedro Almodovar (2003, Best Original Screenplay, Talk To Her; 2000, Best Foreign Language Film, All About My Mother) comes VOLVER, a comedic and compassionate tribute to women and their resilience in the face of life's most outrageous tribulations. A luminous Penélope Cruz leads an ensemble of gifted actresses, including Carmen Maura (Women on the Verge of a Nervous Breakdown). Raimunda (Cruz) and her sister Sole lost their parents in a tragic fire years ago... or did they? Superstitious villagers claim that the girls' departed mother, Irene (Maura), has been seen wandering around their Aunt Paula's home. When Irene appears to Sole, she explains that she has returned to set right her daughters' troubled lives and reveal shocking secrets that will impact everyone! Raimunda has "female troubles" of her own, least of which is a corpse in the freezer! 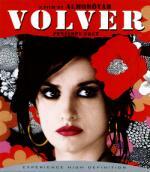 Winner of numerous film festival and critics' awards, VOLVER is a hilarious tale of love, loss and forgiveness. A very entertaining tale which takes you on a journey through an array of emotions from grief to anxiety to humor to redemption. Over the course of just a few days, poor Raimunda (Cruz) is faced with one crisis after another and must rely on her sister, daughter and other female friends to overcome unbelievable obstacles. A very touching ending to a story which twists and turns a few times, leaves you in a feel-good mood in the end, in spite of the fact that bad deeds go unpunished, mainly because they happened to bad people. Unfortunately for those of us of the male persuasion, this movie does not shed a kind light on men as a species. This movie was unusually vibrant mainly because of the use of a lot of primary colors throughout. The not-so-hidden message about wind power was far from subtle as they showed the wind farm at least four times during the film. Excellent film, my wife and I both loved it. I really liked it too and I got a heck of a bargain. Play had a Pink Panther boxset listed for £15 which was a ridiculous price back then, so I tried to snap one up. They refused the order and apologised for the mistake. They sent out a 10% off voucher as compensation, then swapped it for a £10 one! I got this, brand new, just released and only had to pay a couple of quid. Cracking film and I'll have to upgrade to the BR when I see it really cheap.